↑ Potter 2007, পৃষ্ঠা. 35–36. ↑ Dundas 2002, পৃষ্ঠা. 22, Quote: "Mahavira died aged seventy-two at the town of Pava in what is now the state of Bihar. His body was cremated, with the gods taking his bones to heavens and his ashes being distributed throughout the Ganges region"..
↑ Suresh K. Sharma; Usha Sharma (2004). 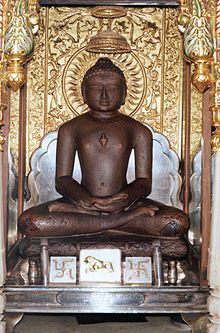 Cultural and Religious Heritage of India: Jainism. Mittal Publications. পৃষ্ঠা. 39. ISBN 978-81-7099-957-7. https://books.google.com/books?id=VwsbJgJX84cC&pg=PA39. , Quote: "The body of Mahavira was cremated in Pava, and to this day the town of Pava, in the province of Bihar is the holy ground for his followers." ↑ Sharma & Khanna 2013, পৃষ্ঠা. 18.